Wearing a suite is one thing you don’t like but you know you can geek it up a bit. 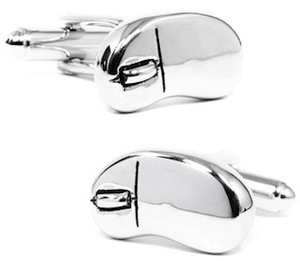 For instance you can get nice cufflinks that look like a computer mouse. These cufflinks are perfect they even have a fake scroll wheel. Cufflinks like these are the perfect gift to bribe a geeky nerd to wear a nice suite. And these cufflinks are have a silver color and an enamel finish making them look really nice and they will last for ever. Come order your pari of Computer Mouse Cufflinks.